Before watching this documentary I'd heard of Howard Zinn and A People's History of the United States has been on my reading list for a while now. This film however is the first I've actually been exposed to his ideas first hand. I have to say I admire the guy, it's really hard not to. He was in on the ground floor during the fight for segregation, was important to the peace movement during the Vietnam war and to this day is still fighting the good fight against all the evil bastards out there. Seems like a heck of a guy and I'm definitely interested in reading his work a great deal more now because I've been exposed to this documentary. That being said I think the documentary falls short in a number of areas. For a man with such a wealth of ideas and intriguing personal history there really wasn't enough depth to this documentary. It's a very glossed over hit the main points kind of documentary. While Zinn is always insightful I think the film maker missed an opportunity to really dive into what makes Zinn tick. There was nothing in the documentary that you couldn't find on Wikipedia. It was worth the watch for me because I was somewhat unfamiliar with who he is but if you're already aware of his background you probably won't get too much out of this documentary. 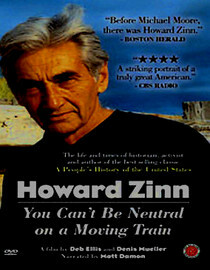 Overall this was a below average documentary that was saved by how interesting just listening to Zinn talk can be. Why is it in your queue? I wanted to learn more about Howard Zinn. Is it artsy? No, just a cookie cutter documentary about a really interesting guy. Best thing about the movie? Zinn's unpopular perspectives. What mood should I be in to watch this movie? Curious about what a real radical sounds like.